Hello, I’m an owner of Tea Ceremony Koto. It’s a small tea house but you can learn the authentic tea ceremony in English by a qualified master of Urasenke, in the best location near Golden Pavilion. To tell you the truth, our plan is not suitable for the tourists who just want to see the “Show”. If you’d like to know the deep Japanese culture touching the seasonal utensils, learning how to move or say as a guest, I’m sure it’s the great place for you to visit. We won’t change our traditional way of Urasenke, one of the biggest tea school in Japan, or omit too much for tourists. We would like to introduce Japanese culture as correctly as possible in English. One-to-one lesson from China, U.S.A etc. She is a student from China, who would like to learn Japanese cultures. First, we’ve started from Ikebana (Japanese flower arrangement) lesson. 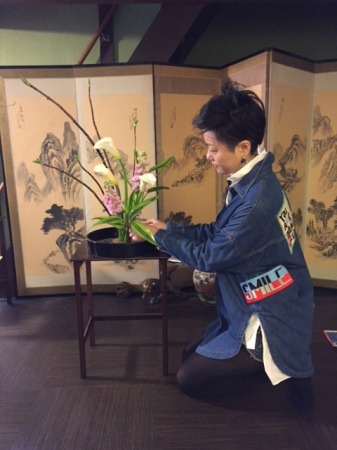 She is not decorating freely, but leaning the basic pattern of Ikebana (Misho- school). Even though it was the first time for her, she had a clear view of deciding the angles and best faces of flowers. She also came alone from U.S.A. 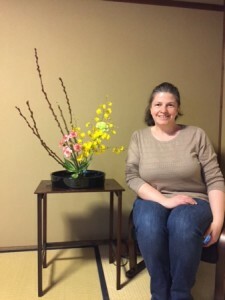 It was first time for her to learn the basic pattern of Ikebana although she had tried in free style 2 times in U.S.A.
We Japanese start learning the basic patterns for the first 3 years, then allow to try free way. She said it was great to learn the traditional pattern of Ikebana, and our flowers were beautiful enough she couldn’t find in her country. 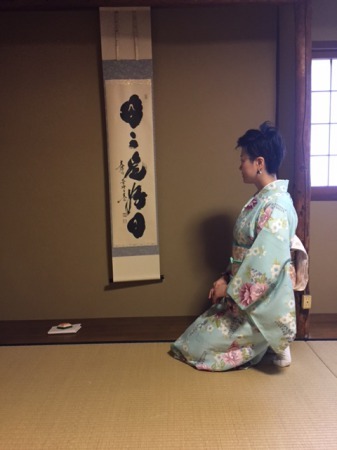 After Ikebana lesson, let’s move on to tea ceremony wearing Kimono!! She is from China. Kimono looked nice on her. Not only foreign tourists, but also Japanese business man also joined the special private lesson (4days course). 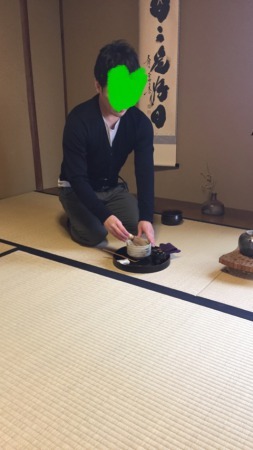 He decided to learn tea ceremony in Kyoto before moving to another prefecture for his work. Since he had been lived in Kyoto for over 10 years, he did like to acquire something to certificate being Kyoto. He visited Tea Ceremony Koto 4 times a month for learning the way of tea on the round plate,which is the first step for beginners. Tea Ceremony Lesson for the last time in Kyoto. How fantastic his decision is! He had practiced at home as well, so he could learn the whole way of tea “ryakubondate” in 4 days. Learning this way of tea, he will be able to do tea ceremony everywhere even on the table. ★4days lesson (90minutes×4days)　25920yen (includeing tax)　You can learn the way of tea on the round plate! Of course, you can master the movement and greetings as a guest, too. 4days lesson is reasonable. No additional fee for a club fee.